Hornady's new Critical Duty handgun ammunition is the only law-enforcement ammunition that currently exceeds the FBI's minimum 12-inch standard for target penetration. That's a bold statement. To pass, bullets have to penetrate 12 inches into 10 percent ballistic gelatin through five different barriers: heavy winter clothing; dual-layer interior wallboard; 3/4-inch plywood; dual-layer auto-body steel; and laminated auto safety glass set at a 45-degree angle with a 15-degree offset. For the last four barriers, the gel is also fronted with a light clothing layer simulating normal indoor wear. Bullet upset is also measured as a means of wound channel comparison between loads having similar penetration. 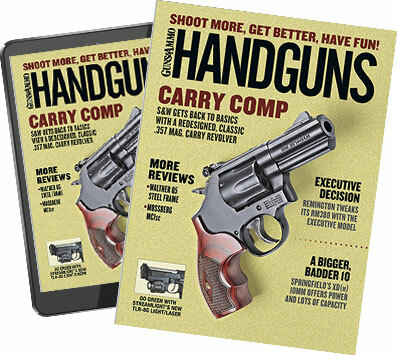 No expanding-bullet handgun load has ever passed all the penetration tests, and the killer barriers have always been the glass and auto-body steel. But Hornady's new Critical Duty exceeds the minimum 12-inch penetration standard for all barriers, and by significant amounts. Initial offerings are a 135-grain FlexLock 9mm rated at 1,010 fps, a 135-grain FlexLock 9mm +P rated at 1,110 fps, and a 175-grain FlexLock .40 S&W rated at 1,010 fps—all from four-inch test barrels. Externally, the Critical Duty FlexLock bullets are virtually identical in appearance to their Critical Defense FTX counterparts except for slight differences in the ogive profiles and an "H" molded into the end of the polymer tip. Internally, they are quite different. Whereas Critical Defense FTX bullets have a soft lead core and a thin jacket designed with the intent of only being fired through clothing, Critical Duty's FlexLock bullets have a very heavy jacket and a harder, high-antimony core designed to defeat barriers. The jackets are locked to the core via the same InterLock process the company uses on its centerfire rifle bullets. Engineering a terminally effective bullet design that will perform as required after breaching a hard barrier but will also perform as required in an unshielded or lightly shielded target is a real trick. Hollow points can get plugged with clothing material, and on targets behind hard-to-penetrate barriers, bullets have to retain enough velocity and momentum to get 12 inches deep, with frontal upset-diameter that will allow sufficient penetration after the barrier slowdown. At the same time, it needs as much upset as possible to create the most effective possible wound channel. If it doesn't have any frontal upset at all, it will act like a hardball round and can over-penetrate even at a very slow post-barrier velocity. The Hornady Critical Duty FlexLock bullet balances all these factors by retaining the malleable polymer nose plug of the Critical Defense FTX bullet—which prevents hollowpoint deformation or plugging when passing through clothing and aids in rapid upset—while its harder core and locked-on thicker jacket provide the strength and integrity to breech the harder barriers and still perform as needed in the target on the other side. low-signature muzzle flash and lower recoil compared to same bullet-weight/same-velocity loads with conventional propellants. The propellant also features an improved burn-rate stability at a wider range of ambient temperatures. The ogives of the Critical Duty bullets themselves don't taper as much as bullets such as the company's hollowpoint and XTP offerings, a characteristic required by the hollowpoint insert that also improves feeding. setback in the case. Most autoloader ammunition is taper-crimped without cannelures, which can allow bullets to be pushed back in their cases if repeatedly chambered and re-chambered in autoloaders. And finally, the entire Critical Duty line employs shiny silver nickel plated cases because they're visible in low light and don't acquire a surface patina that can cause drag and failure to feed or extract. sheet metal at 13.1 inches. Half of the tests exceeded 15 inches of penetration; three-quarters of the results fell into the 14-inch to 15-inch range, which is ideal from a law-enforcement ammunition perspective. None of the barriers defeated any of the loads. Weight retention was more than 99 percent for everything but the auto-glass barrier, which is notorious for cutting and stripping away bullet material. Still, the loads averaged 70 percent weight retention in the auto-glass test, and the average post-barrier penetration depth exceeded 14 inches. In the tests I witnessed, I was also impressed by how well the bullets tracked, regardless of load or barrier. Hornady's new Critical Duty ammunition will certainly attract attention from law-enforcement agencies nationwide and armed citizens alike. But it is critically important for an armed citizen to understand that personal defense ammunition standards and law enforcement ammunition standards are not the same. Police officers may be called upon by their duty to exchange fire with criminals concealed behind walls or inside a vehicle. But for an armed citizen, legally justifiable "personal defense" is just what the term implies: personal. Up close, exposed, face to face. As the guys at Hornady informally put it: "Critical Defense ammo is for us. Critical Duty ammo is for cops."